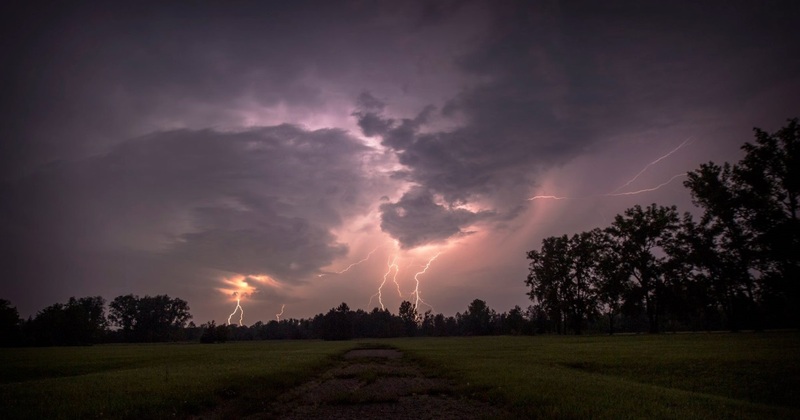 Thunderstorms are possible this evening in the Finger Lakes, a few of which may be strong. A few strong thunderstorms capable of strong winds and small hail will be possible tonight in the Finger Lakes, especially for areas further west. Thursday is off to a cloudy, foggy start in the wake of yesterday’s rain. Temperatures this morning are mostly in the upper 40s to near 50 degrees. The system that moved through yesterday has departed, but a frontal boundary extends from east to west across the region between that system and a second area of low pressure tracking quickly east from the Midwest. That frontal boundary will lift north today as the next system approaches, resulting in an increase in temperature. However, the front will likely stall out over the region, leaving the northern Finger Lakes cooler, especially right along the shore of Lake Ontario. Those areas will be stuck in the 50s, while most of the Finger Lakes pushes into the 60s this afternoon. A period of sunny skies will likely develop this morning, helping boost temperatures upward. Clouds and some showers or thunderstorms will move back in this afternoon, especially for the northern Finger Lakes during the early and mid afternoon, and the eastern Finger Lakes for the late afternoon. Any thunderstorms that do develop will probably not be severe this afternoon. Severe thunderstorms over southwest New York will weaken as they move northeast this evening. The main severe threat will come this evening as a cold front enters the region from the west. 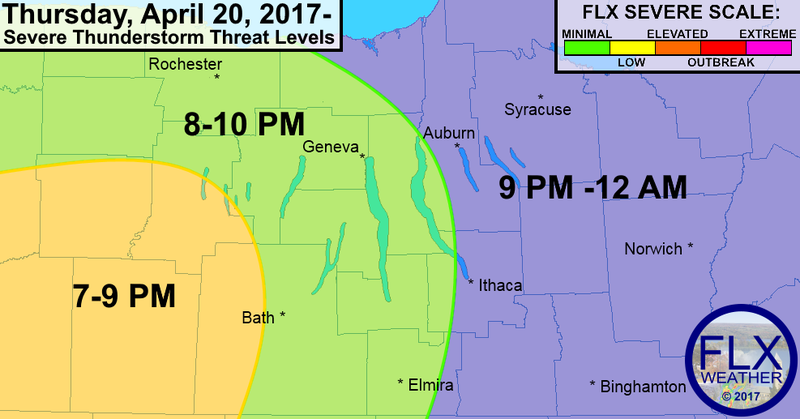 Southwestern New York stands the best chance at severe weather, roughly from Dansville south and west, in the yellow shading above. These areas will have the best combination of warm, humid air and favorable timing early in the evening for the front. Thunderstorms should develop and/or move into the area around sunset. Wind and hail will be the primary concern, but there will be a bit of spin in the atmosphere, so a brief tornado cannot be ruled out, especially closer to Lake Erie. Thunderstorms will expand north and east during the mid-evening hours but will start to weaken as they encounter cooler, less humid air. Still, some gusty winds or small hail may be possible for the areas shaded in green, which includes much of the Finger Lakes. Severe weather is unlikely further east in the blue shaded areas, where storms will not arrive until late in the evening. Be sure to check your zip-code forecast for the complete details on what to expect for your town. Rain will continue overnight after the initial round of thunderstorms moves through the region. By Friday morning, the rain should taper to a few showers. Precipitation should end completely during the midday hours, if not sooner. A little sun may even come out for a time Friday afternoon. Temperatures should be able to shoot into the 60s for a time before the cooler air truly starts to arrive. The core of that cool air will move in Saturday when highs are only expected to be in the 40s. Skies will be cloudy, but no precipitation is expected. Sunday will turn sunnier and mild, with highs around 60 degrees. Early next week also looks quiet, with no rain expected until Wednesday. It has been over for quite some time now. Starting to see the opposite problem with too much rain too often. Mostly minor..so far. Can you comment on the status of the drought in our area in the aftermath of the current rains? Is it over or are we still catching up? Thank you!